I wonder about ads on my blog...I am not sure what kind of ad revenue I would generate...or what type of ads, for that matter. And it is distracting. I hate reading a blog and seeing some ad for diet pills with a cartoon character dancing on the side. Or an ad for funeral homes, or loan refi's. Actually, I don't hate it. It's just distracting. It's the very reason I went away from my old blog layout. Even though it was more "my style" with lots of color and pattern, I felt that it detracted from my words and pictures. And I had to cut out the music for the same reason. I would be reading a blog about a sad event, when some Top 40's hit would come blaring out of my computer speakers. It just didn't fit. BUT...if you could make a mint, while you blogged, is it worth it? I mean, it'd be great if I could hand-pick the ads. 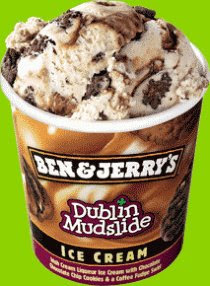 Ben and Jerry's Dublin Mudslide, which I have not seen in the store for a month and I am starting to worry/sweat/hyperventilate if they are no longer making it! Picked it up at Serendipity's in New York. It's their brand. The flavor is hot chocolate, and when I wear it Shelby tries to lick my arm, it smells THAT good! There is something so luxurious about wearing deodorant with the scent of Donna Karan's perfume...And NO white residue. Pure heaven. Worth every penny, or in this case- dollar. Omega 3's and 6's. Flax seed. No artificial ANYTHING. Having a pb&j is a treat I love again. (a REAL 7, because the airbag turns off in the front passenger seat when a child (who should be at least 7) is in it, with stadium seating so that I can walk back to the back seat, instead of climbing over a row of seats, when a certain child might need a little talking-too (I am not naming names here Dalton or Shelby). The middle stadium seats slide way forward so I can stick that binky (if my kid was ever kind enough to take one of those things) back in to my baby's mouth, whist still driving with my other hand (not sure if this is a legal move, but now that my right arm is completely dislocated from doing it so often, I am OK to make use of my super-elastic limbs. Also- Autostart (aka: with one touch of a button from inside my home, in the dead of winter, when we are running to take Dalton to school because there is a blizzard and he slept late, I can whisk my kids out of the house and in to a warm car, instead of a frozen block of ice, which comes in handy seeing as we live in a house where the so-called "garage" is detached and is the size of a Tuff Shed that looks like it would house an Umpa Lumpa's car. ALSO, the thing has Onstar, which means I get to make calls with the touch of a button. "Who cares that I forgot my cell and I've got to remind Gavin to take the roast out of the oven!" The LIVE people in "Onstar world" even walk me street-by-street with their Navigation System when I need to find the nearest dry cleaner, or a Crispy Creme in Sandy. And in case of an emergency there is this cool little red button (kind of like that one that Willy Wanka had in his elevator, but never pushed until Charlie got there). Oh, AND you know how you wonder "When was the last time I changed my oil/ put air in the tires, etc... was it last month, or last year??? Well, this car has a ultra-smart computer that is linked to a satellite GPS system, so not only can I NEVER get lost, but the car (OK, the computer people behind the company-this isn't Nightrider) emails me to tell me when the air in one of my tires is low, or if I need more windshield wiper fluid, or anything else that could need fixing with the car! How cool is that? AND, the people at Saturn will give you another car while you get it done, or just drive you wherever you need to go! I LOVE THIS CAR. So, if I could pick ads like THAT...ads that I believed in- that would really be cool. But that is fantasy land for now. So, with all that said, I am going to give the blog ads a try. What's the worst that could happen?...besides being utterly annoyed. Oh, and if you talk with anyone from Ben and Jerry's, Mustella, or Saturn, tell them I sent you, and I am waiting for my check. I've found some ads to be very distracting...namely the one with the rolling muffin top advertising diet pills and...ugh...the one for Chris Brown of which we all know he alledgedly beat up his girlfriend...I was actually disgusted by that. Personally, I'd rather have more control over the ads displayed on my blog. Just my two "sense." Oh My! I had no idea they made Donna Karen Cashmere Mist DEODERANT. I'm going to MACY's tomorrow to get it. Love that stuff!!!! !Thanks for the tip.